A COUPLE of months ago, a Silicon Valley start-up invited me to review its new home thermostat. I wasn’t expecting much. Can you blame me? Thermostats are annoying. Many models require that you study a cryptic manual to set your heating and cooling schedule; on some models, even replacing the batteries can test your patience. If you do go through all the trouble of setting up an ideal schedule, then when the weather or something else in your life changes (say, your cold-fearing relatives from Florida move in for a few weeks), the thermostat won’t adjust to your new circumstances. Then you have to program it all over again — or, more likely, forget about programming it and manually change the temperature a few times a day. Over the last few weeks, though, I’ve become unreasonably excited over these devices. That’s because I’ve tested several new models that all offer much-needed improvements over the run-of-the-mill thermostats that most of us have on our walls. Depending on the model, these new devices can accomplish several amazing feats. They connect to the Internet, which means they can be adjusted from afar, using the Web or your phone. The Internet connection also allows them to get information about your local weather and tailor their work accordingly. Lastly, these thermostats all have more advanced, sometimes easier-to-use interfaces, to make programming less of a chore. Indeed, the device made by that Silicon Valley start-up, called the Nest Learning Thermostat, even promises to automatically create a schedule suited to your tastes. Let’s start with the Filtrete 3M-50 Wi-Fi Remote Programmable Thermostat, made by 3M. The Filtrete sells for about $100. A basic thermostat is $20 to $60, but $100 is much lower than the price of the other high-end thermostats I tried — although this low price comes with a few disadvantages. The 3M-50 does have the Web capability of the new crop of thermostats, but to connect it to your Wi-Fi network requires a special power cable that runs between your heating or cooling equipment and your thermostat. Many older homes, including mine, don’t have this wire; I had to repurpose another wire to get it working, but you may need a professional to install the device. I also found the 3M-50 operating manual to be convoluted and the touch screen not very precise; sometimes when I was trying to press one button, I wound up engaging another. The 3M-50 comes programmed with a schedule designed to save money on energy. I found this preset schedule fairly comfortable; I just needed a few tweaks to achieve an ideal temperature. The manufacturer promises that if I stick closely to the preset program, I could save up to one-third on my energy bills. 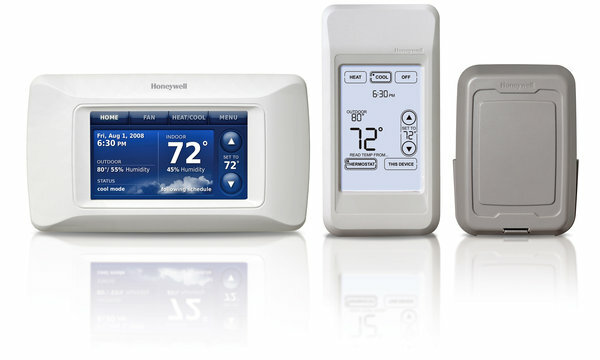 More costly than the 3M-50 is the Honeywell Prestige HD thermostat, which can be combined with several add-on components. The Prestige isn’t sold to the public; you must buy it from and have it installed by a professional contractor. It will cost $200 to $300, not including labor. And the added components — like sensors to read temperatures in different rooms or a module to control the device over the Internet — sell for more. Over all, the entire system can cost upward of $500. My system was set up by Innovative Mechanical, a heating and air-conditioning company in the San Francisco area. Its technicians also installed an outdoor temperature sensor and an Internet module, and a Honeywell representative helped me program the temperature setting and showed me how to change it. I liked the Prestige quite a bit. The touch screen gives you a general’s view of your home’s climate. The bright blue display and the readings of the temperature and humidity (inside and outside your house) make it look like a screen from the Weather Channel. But my favorite feature was a small hand-held unit called the Portable Comfort Control. When you set a standard thermostat to, say, 70 degrees, it will adjust the temperature until its own sensor reads 70 degrees. But in many homes, there’s a vast difference between the temperature at the thermostat and the temperature in far-flung bedrooms. The portable control solves this problem by having its own temperature sensor; by tapping its screen, you can set the thermostat to use the controller’s sensor as its main reading. If you set the thermostat to 70 and you bring the controller to your bedroom, the Prestige will see to it that your bedroom is heated to exactly 70. This was a blessing for me. My home office, where I spend eight hours a day, usually gets much warmer than the rest of my house. Locating the portable control there during the day kept the heat off longer, saving energy. My favorite of the new thermostats is the Nest. When I saw it, I swooned. A brushed-steel orb that resembles HAL from the film “2001,” the Nest looks like no other thermostat. Also unlike most of them, it promises to learn your temperature preferences, set itself up automatically, and, as your tastes change, strive to keep up. The Nest costs $249 from the company’s Web site or from Best Buy, though you have to wait: When the Nest went on sale a few weeks ago, it sold out immediately. The firm has declined to say when the Nest will become available again, but you can fill out contact information on the site to get an alert when it does. You can install it yourself, or pay $120 to a Best Buy installer. I popped it in myself, and found it easy. The instructions were clear and the device ships with all necessary parts, including a built-in level to help you install it straight. The firm says that the Nest is compatible with most heating and cooling systems; to see if it works with yours, there is a handy guide on the Web site. I installed the Nest in 30 minutes, with another 5 to set it up and learn how to use it. This is the Nest’s best feature. Because it was designed by Tony Fadell, who headed the team that created the iPod, the Nest has a wonderfully intuitive user interface that even technophobes will quickly grasp. You control the device by turning a wheel on its circumference, and you engage its main button by pushing on the face. Don’t worry if this sounds complicated; once you touch it, it will be obvious how to use it. The Nest requires no programming. It has a host of sensors and sophisticated algorithms for learning your temperature preferences. For the first few days, you set the temperature yourself; as with the other new thermostats, you can control it from afar through the Web or an iPhone or iPad app (an Android app is coming soon). A few days after my installation, the Nest reported that, from my initial manual settings and other sensors, it had learned the family’s habits and preferences. It would warm up early in the morning, cool down when my wife and son left for the day, heat up again in the evening, and cool down once more, at bedtime. This analysis was right on the money. The Nest further encouraged efficiency through subtle persuasion: if you set your temperature to a slightly more environmental (and economical) setting, the Nest displays a leaf icon on its front panel. But when we had houseguests and I raised the temperature to make the guest room more comfortable, the device did not adjust to those changes. This forced me to manually tweak its schedule. Because the Nest is connected to the Internet, though, the company says that it can periodically issue software updates to improve the thermostat’s ability to learn your preferences. This is an amazing possibility. Not only did the Nest start out working pretty well, it promises to keep improving.